"This book is intended to support the kind of intimacy, comfort, nourishment, and grace that happens when you make contact with the Source of all love that fuels your very existence. Regardless of your spiritual orientation, consider this book a prayer of sorts, one that invites you to gently, quietly reunite with the purest, most loving core of your being, the part that will help you navigate the in-between space in your spiritual life." As you read each day, you'll learn to embrace your own authentic knowing and trust the voice of your divine self. 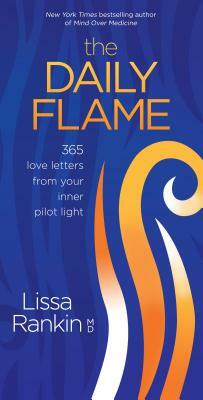 Enter the mysterious landscape of the soul and let your light shine bright with The Daily Flame. Lissa RankinLissa Rankin, MD, New York Times bestselling author of Mind Over Medicine, The Fear Cure, and The Anatomy of a Calling, is a physician, speaker, founder of the Whole Health Medicine Institute, and mystic. Passionate about what makes people optimally healthy and what predisposes them to illness, she is on a mission to merge science and spirituality in a way that not only facilitates the health of the individual, but also uplifts the health of the collective. Bridging between seemingly disparate worlds, Lissa is a connector, collaborator, curator, and amplifier, broadcasting not only her unique visionary ideas, but also those of cutting-edge visionaries she discerns and trusts, especially in the field of her latest research into "Sacred Medicine." Lissa has starred in two PBS specials and also leads workshops both online and at retreat centers like Esalen and Kripalu. She lives in the San Francisco Bay Area with her husband and daughter. For more, see LissaRankin.com.